Txuspo Poyo (Alsasua, Navarra; 1963) holds a BA in Fine Arts from the University of the Basque Country (UPV). In 2001 he completed an ISCP residency sponsored by Fundación Marcelino Botín and also studied at the CADA center of New York University. In 2006 he received funding from Fundación Arte y Derecho and Fundación de las Artes de Valencia for his Delay Glass project, and the same year won the Premio Gure Artea of the Basque Government. In 2008, he was awarded first prize at the 10th Unión Fenosa International Exhibition. He has taken part in the Madrid Region’s 15th Image Symposium, and has been an invited speaker on master’s programs at the University of Cuenca and the UPV. He has held solo exhibitions in venues such as Museo Artium in Vitoria, Centre d’Art la Panera in Lleida, the Costa Rica Museum of Contemporary Art and Design and the Montcada Gallery of Fundació la Caixa in Barcelona. 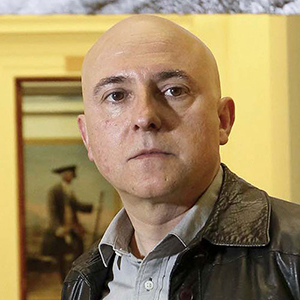 His group exhibitions include Geopolíticas de la animación showing at the CAAC in Seville and MARCO in Vigo; Les Rencontres Internationales Paris/Madrid/Berlin; the 2nd Angola Triennial; the FILE in São Paulo; Incógnitas at the Guggenheim Museum Bilbao; Cine y casi cine at the Reina Sofía in Madrid; Multitude at the Artists Space in New York, and Fundación Sandretto Re Rebaudengo, in Guarene-Turin, Italy. This project is an attempt at a residual image of the construction of the La Engaña tunnel. It is a fabric made from the threads of various intertwined stories expressed in fragments of memory, identity and legacy, inviting re-readings of an unfinished tale somewhere between fact and fiction. The La Engaña tunnel, with its 6,976 m length, was at the time the longest tunnel ever built in the Iberian Peninsula. This giant railway infrastructure lies between Burgos and Cantabria, and was the last stretch of an ambitious project to create a train link between the city of Santander and the Mediterranean coast. In 1941, the office in charge of public works deployed squads of political prisoners to the area. There they began building workers’ settlements, together with other laborers from all over Spain. The tunnel was completed in 1961, but the project was put on hold until 1985 when the government decided to abandon it. Inside the room, one screen shows the historic trepanning of a mountain and its interior bracing, rivalling in proficiency with a team of operatives who hollow out a pachyderm before mounting its inner frame. On the other screen, an elephant advances through the ruined remains of platforms, a station and the former workers’ homes before ending up inside the tunnel. The animal’s state connects with the accounts of survivors in terms of physicality, emotional charge and feelings of grief. On both screens, the actions of digging and emptying draw on the poems Digging by Seamus Heaney and The Hollow Men by T. S. Eliot, as if each were stationed metaphorically at one of the tunnel’s extremes. A third screen in the hall depicts a recent action performed at the southern mouth of the La Engaña tunnel, now sealed off by a wall. A worker is engaged in restoring the missing letter “E”. Lodged inside the new “E” is a time capsule with the spoken testimonies of survivors who worked at both ends of the tunnel. The tunnel is a deep hole in the body of history, the inside of a belly emptied of its organs, a cave, a dark abyss, a wound, but also the door that leads us to the unknown and an entrance to advance beyond, despite the warning.